I’m not sure what’s going on this week that’s bringing us all this disgusting stuff, but here we are. At least this time there’s a journey from revolting to acceptable, a pattern we should all strive for in our lives. 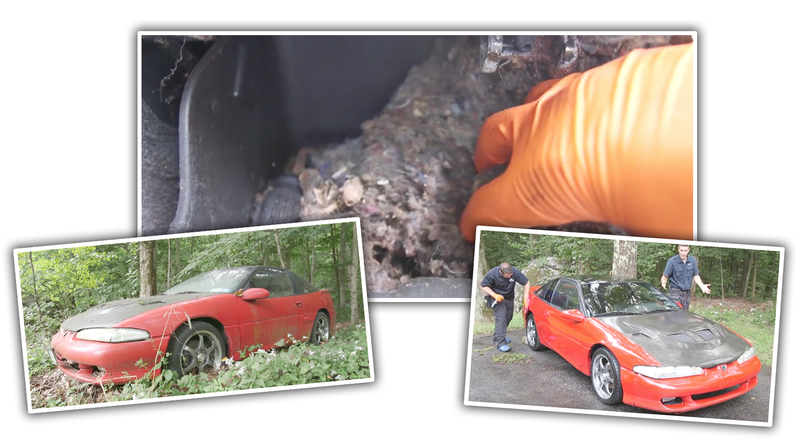 The car here is a 1994 Eagle Talon TSI that’s spent a decade in the woods, and has accumulated a massive amount of filth, mold, rodent skeletons, and stench. If you know of a car in a similar sad state, this video is a good guide to how you bring a car back from the depths of revulsion. Car cleaning impresario Larry Kosilla takes on one of his toughest challenges yet, and if you’ve got the stomach for it, you may learn a thing or two yourself. Mainly I’d recommend never letting a car get anywhere close to this bad, and that while Eagle Talons are cool, sometimes it’s worth just letting nature have them. Yeesh. That’s pretty intense, and you should be happy those USB-based olfactory-experience emitters we were experimenting with never caught on. It seems this Talon is going to survive and get a new life in the Caribbean, so this disgusting story at least has a happy ending.